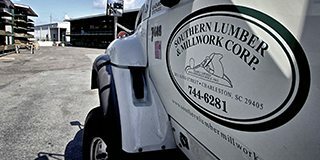 Let Southern Lumber’s delivery service prove to you what separates us from the competition. Our well maintained fleet and diversity allows us to fulfill all of our customer’s needs. With our qualified and trained staff, we ensure quick and accurate delivery (within 24 hours) throughout the Charleston tri-county area. Our customer’s businesses thrive due to our reliable deliveries of quality materials when they want it, where they want it, and how they want it!